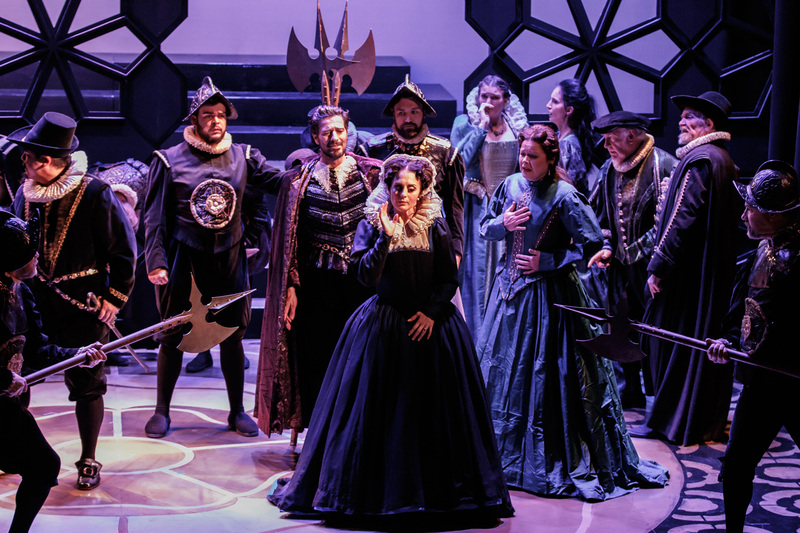 Melbourne Opera raises the bar yet again as a superb cast perform bel canto classic Mary Stuart in a lavish, inventive and highly attractive staging. It is wonderful to welcome Elena Xanthoudakis back to the Melbourne Opera stage, and to enjoy the flourishing talent that has seen her international career thrive in recent years. Equally thrilling is the extraordinary late-career form displayed by Rosamund Illing, one of the most successful Australian sopranos of all time. While male singers seem to be given more chances to continue on stage to a grand age, the same opportunities are rarely offered to their female counterparts. The recent reversal of Emma Matthews’ Opera Australia status from Helpmann-winning star attraction to occasional supporting player was baffling in its almost overnight immediacy. 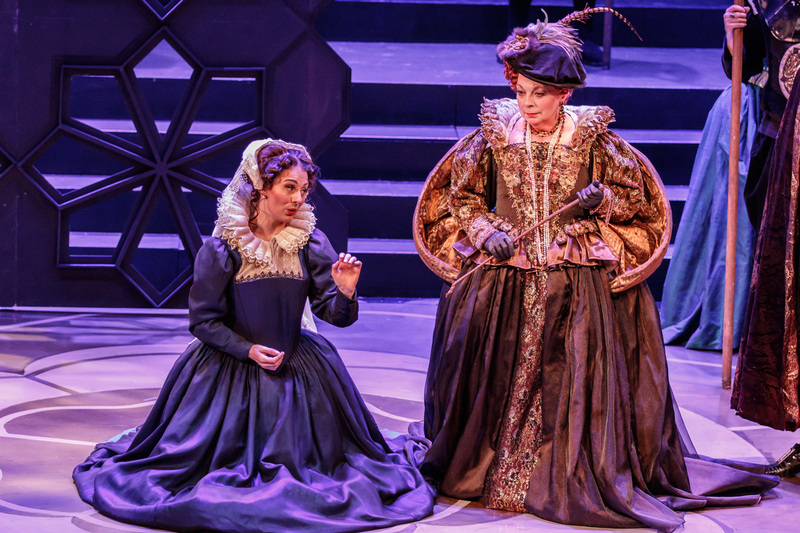 Illing’s performance as Queen Elizabeth I displays not only her well preserved voice, but also the immeasurable benefit of decades of stage experience. Whether sharing a coy smile or an icy glance, Illing conveys Elizabeth’s haughty, imperial presence with élan. Along with the many impressive facets of this production, the opportunity to see Illing in action again is a prime attraction. 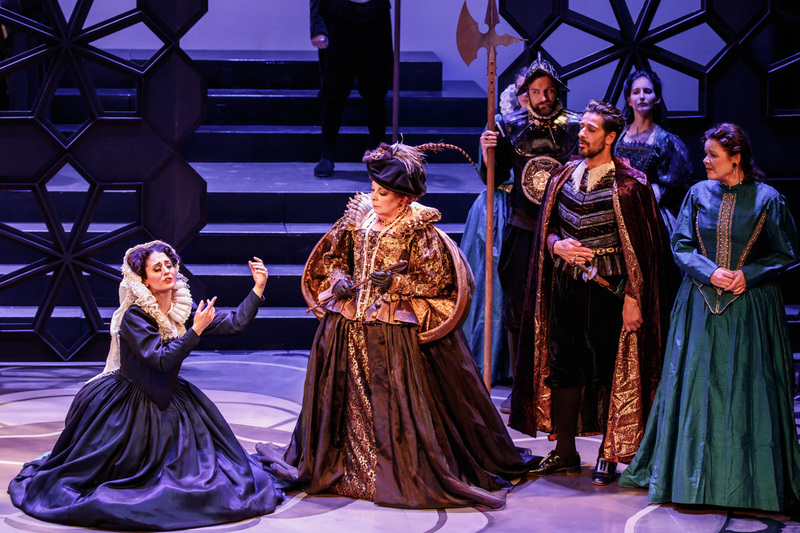 In what may be the most expertly realised production staged by Melbourne Opera to date, Mary Stuart gleams with regal gloss and polish. Christina Logan-Bell’s abstract set is inspired, combining a shiny floor of Tudor roses with attractive geometric wall designs and the overall suggestion of a crown itself. In the final scene, rear stairs rise to an ominous chopping block. Enhancing this scenic design, the company has been extremely fortunate to secure the use of a stunning set of costumes, designed by Jennie Tate and owned by Opera Australia. The chorus progress from festive emerald greens and purples to dark cloaks and hoods from the dramatic final scene. 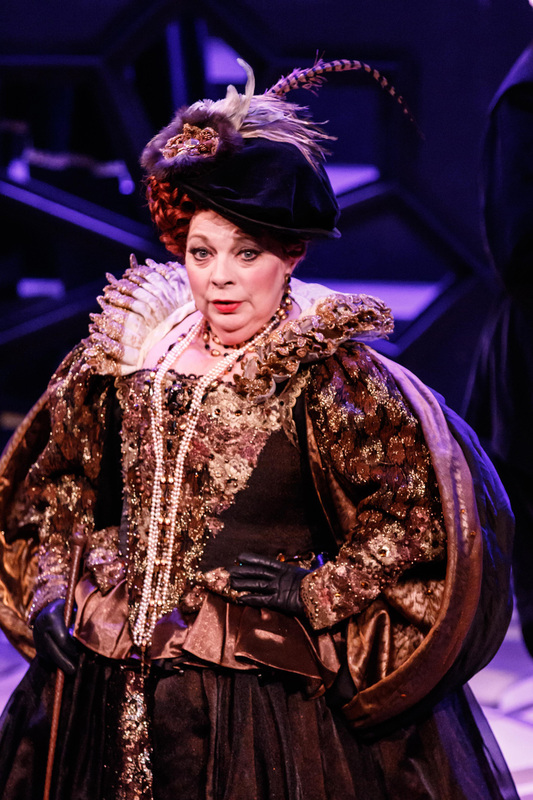 The lead men sport smart pantaloons, velvet vests and fetching headwear, but the most eye-popping costumes are reserved for the queens, particularly Elizabeth. Mary’s main gown is a clever mix of electric blue satin covered with fine dark black lace. For the final scene, she appears without bustle, making her look all the more vulnerable and exposed. The final onstage change to fiery red for her execution has tremendous impact. Scenery and costumes alike benefit from the excellent lighting design of Lucy Birkinshaw. Maestro Richard Divall returns to a score he first conducted some 40 years ago (for Victorian Opera Company). Divall coaxes the very best playing from the musicians in Melbourne Opera Orchestra. Director Suzanne Chaundy presents a strong, clear telling of the drama, keeping the atmosphere terrifically tense. There are some challenges with spacing in the crowded opening scene, but Chaundy’s eye for detail comes to the fore in tighter scenes involving fewer players. 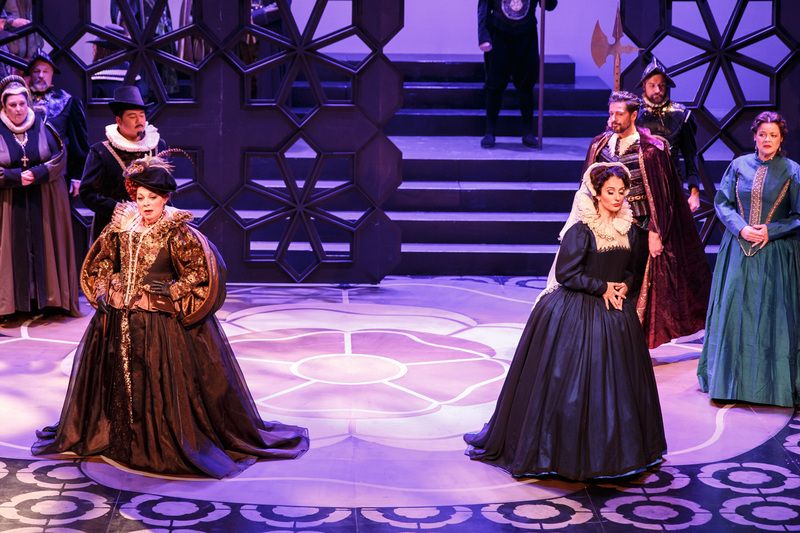 The faceoff between the two queens is a crackling climax to act two, and act three builds with a requisite sense of impending and inescapable doom. Xanthoudakis is in wonderful voice, performing Donizetti’s bel canto music to delightful effect. Her ornamental phrases and coloratura are supple and tender. Xanthoudakis’ performance of Mary’s final prayer, “Ah!! May Thou hear the sound of our humble prayer,” is particularly exquisite. Xanthoudakis and Illing are supported by an extremely strong, very well cast set of singers. Eddie Muliaumaseali’i brings gravitas to the role of Lord Cecil, conveying the malevolence behind the man who encourages Elizabeth to sign Mary death order. Act three trio “Alas! For pity’s sake spare the final blow at least” is a masterful scene between Muliaumaseali’I, Choo and Illing. Mezzo-soprano Caroline Vercoe, who is as talented an actress as she is a singer, lends sensitive support as Mary’s compassionate companion Anna. The quality of the chorus singing is easily on par with the principal singing, thanks to expert preparation from Raymond Lawrence. Their excellent work at the top of act three’s final scene continues into beautiful singing in Mary’s final prayer. Not receiving any government subsidies, Melbourne Opera is like a gift to the city from hard working arts lovers and incredibly generous arts angels. No opera lover in Melbourne should miss Mary Stuart. 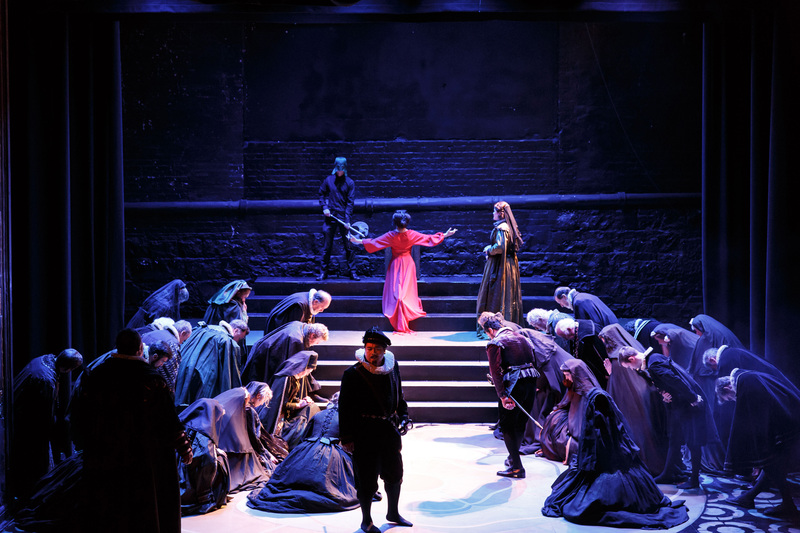 Mary Stuart plays selected dates at Athenaeum Theatre, Melbourne until 12 September 2015, with a further performance at Alexander Theatre, Monash University on 19 September 2015.